Convict Department 1868: Overprinted "C.D." in red with opt. shifted to left, on 1 s. red-brown, wmk. Large Star, rouletted with vertical line of perforations (perf. 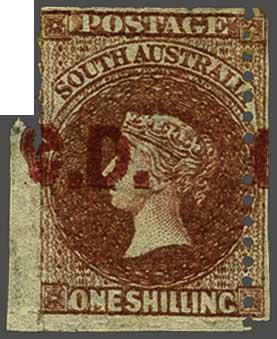 11½) at right (as in the great rarity Gi. 49b without Departmental overprint), unused example in a rich shade, fresh and very fine, large part og. Butler 3R+. Cert. 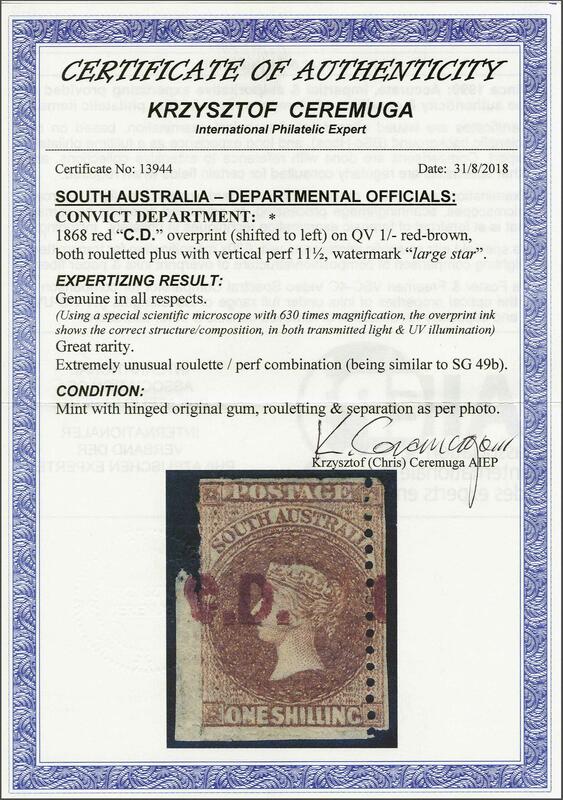 Ceremuga (2018).rnrnProvenance: Collection Rev. James Mursell.rn Collection Col. H. Napier, RL, Basel, 20 March 1979, lot 339.rnNote: This stamp is mentioned in 'The Departmental Stamps of South Australia' by A. Ron Butler RDP on page 71.